We had such a blast working with Barbara on her Art Deco-inspired wedding invitation suite. 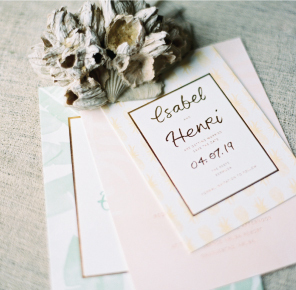 Gold and gray color palettes, reply postcards, and hand calligraphy accents have all been huge hits this year, and we love how they all came together in this one-of-a-kind set. Our favorite part? The champagne gold foil-stamped envelope liner (photos just can't capture how incredible it is!). Emily and Mark invited their guests to set sail with them from Fort Lauderdale for their wedding on the open seas! We created a nautical monogram for them, and used the anchor motif throughout the set. Keeping with the theme, the back of their invitation featured a nautical map of South Florida. We especially love the "advice for the couple" coasters - they're fun for the reception, and make a great keepsake after the wedding! After a busy few months creating last-minute paper items for all of our May couples, we are taking a second to share some of the beautiful invitation sets we've been creating! Ashley and Jesse were some of the sweetest people we've had the pleasure to work with. We created beautiful all-gold invitations for their Villa Woodbine wedding, with a pocket backer to hold their travel and accommodations information and reply set in a neatly contained package. 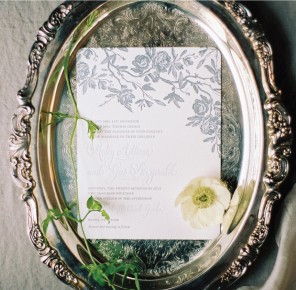 They carried the classic look throughout their wedding with programs and letterpress thank you cards.